Hi Friends! Hope you are doing well. The calculator mentioned above shows the Fahrenheit to Kelvin Converter. Simply, put the required value in Kelvin on the box given above that will consequently convert it to Kelvin. We need to convert from Fahrenheit to Kelvin every now and then based on the technical needs and requirements of our work. Following is used to convert from Fahrenheit to Kelvin scale. The temperature in Kelvin is equal to Fahrenheit minus 32 times 5/9, plus 273. 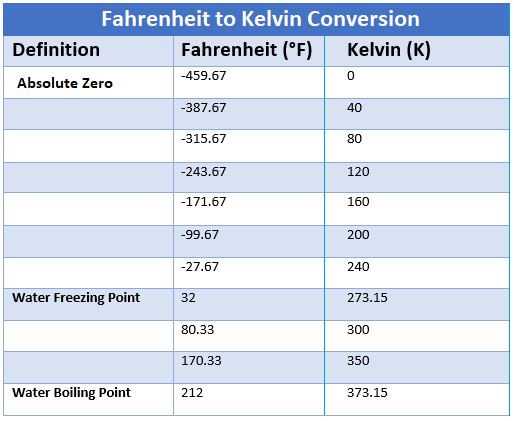 Following table shows some common values used in Fahrenheit to Kelvin converter. Fahrenheit can be defined as per the nature of water where it freezes at 32 F and boils at 212 F. Fahrenheit is a scale named after German physicist Daniel Gabriel Fahrenheit who proposed this scale in 1724. He did an experiment on ice-salt mixture, concluding 30 F as the freezing point of water, while the normal body temperature was around 90 F.
Nevertheless, these values were not accurate, which made him perform a further experiment to propose the actual value, terming 32 ºF as the freezing point of water and body temperature around 96 ºF. Later, the value of body temperature adjusted, finalizing 98 ºF as the normal body temperature. Kelvin is a thermodynamic temperature scale that is mainly based on Absolute Zero. It is denoted by K without any degree sign, unlike Celsius and Fahrenheit scale that come with degree sign on them. The degree sign was omitted to indicate the absolute value on the Kelvin scale while other two scales encompass some arbitrary values in temperature. The absolute zero is equal to 0 K or – 459.67 F that is defined as a point where all thermal motions seize to flow. Initially, the Kelvin scale was written with a degree sign that made people confuse it with the Rankine scale. In 1968, the degree sign was removed to lay out the explicit different between Kelvin and Rankine scale. It is important to note that, these temperature scales don’t share a common point and some offset is required to be added in the start to make them equal. Also, once some offset is added at the start, both Fahrenheit and Kelvin don’t increment with a regular interval, instead show some arbitrary behavior on the scales. That’s all for today. I have given you everything you need to convert Fahrenheit to Kelvin. If you are unsure or have any question, you can ask me in the comment section below. I’d love to help you according to the best of my knowledge. Feel free to share your feedback and suggestion, they help us provide you quality work as per your needs and requirements so you keep coming back for what we have to offer. Thanks for reading the article.